every time i get out of the shower i place a small dollop of moroccan oil in my palms and douse my ends, it smells delicious. i then take a fair amount of that MOST AMAZING PRODUCT, bb texture, and massage it through all of my hair. it's gooey and weird, but seriously does the most amazing things to my hair. and then after my bangs are mostly dry i spritz them with some of that renee furterer dry shampoo ... you know to keep them from going all gross and greasy. 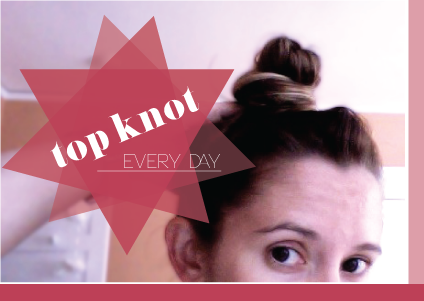 yet still EVERY.SINGLE.DAY my hair is up in a top knot. i might make it five minutes at my desk before it gets there, but without fail it's up before lunch. maybe i need a haircut (ok that is a definite) and maybe i am a little lazy (another definite) but i'm starting to feel, well, a little lame. Your top knot looks so pretty though! Mine always looks like I just got out of bed (not in a good way). How do you do it?? you do make it look good. wow, such a beautiful blog! i stumbled over here via amandajane and im glad i did! hahaha! haven't cut my hair in 2 years, and everyday, I do the same thing. I try to wear it down to work, but by the time I've been at my desk for 2 minutes, it's up. oh well.